"Description: In 1889 this clay doll, about 1 1/2 in length, was brought up by a well drill from a depth of 300 feet. The strata at this depth is dated at about 2 million years old. 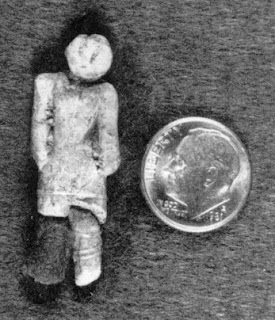 The figurine was found under several different strata including fifteen feet of lava basalt. Also from this depth were brought up many small clay balls."